Without the sponsors the festival wouldnt be where it is today so we would like to say a HUGE thanks to them for making it happen! Our festival was founded by two people but Beth and Andy quickly became cogs in a much-bigger wheel. 'Team Orange' is made up of many, many more people. There's more than 100 volunteers and there's also the core team of seven, who run the event. But the ingenuity and hard-work of our sponsors is also essential. So we hope you'll take a minute or two to read up about the people who've made our event what it is. 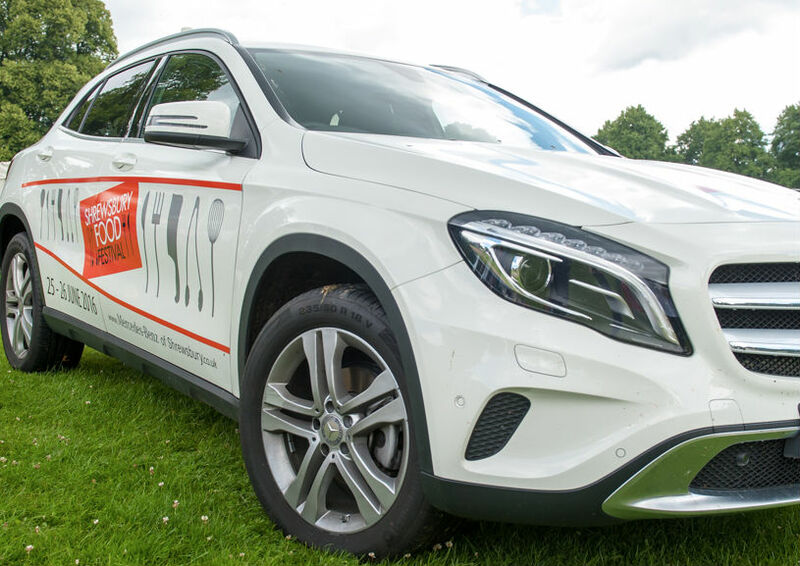 A huge massive thanks to Mercedes Benz of Shrewsbury - this amazing team continue to support us year after year, and bring glitz and glam (in g-g-gorgeous vehicular form) to our festival. Including an amazing Shrewsbury Food Festival vehicle for us each year. We know Mercedes-Benz believe in 'The Best or Nothing' and we are so thrilled that they have joined with the Shrewsbury Food Festival Team to create the best Festival in Shropshire! These guys have made it possible for us to have Chef School this year and for that we are very grateful. The FBC Manby Bowdler team will be working hard behind the scenes so make sure you say a huge thank you for making this happen! The Buttermarket are behind our main bar. The Buttermarket have established the best venue in the region. These guys are the best kind of accountants. They believe in lots of smiles while dishing out sound and savvy advice. They even manage to keep the Director of Fun and the Shrewsbury Food Festival team sorted finanically. Thanks to the team at TCA Accountants for understanding us and supporting our festivals. The Chefs who star on our Chef Demo stage all appear free of charge. They do it for the love of it – there isn’t a big fat pay cheque waiting for them once they’ve finished. The stage itself is sponsored by Wenlock Spring www.wenlockspring.co.uk. We’re grateful for their continued support and hope the alliance will continue for many years. A huge thanks to Monks Estate Agents, who have generously provided us with signage for the event. Monks, Shropshire's savviest estate agents have been such a great support to us over the years! Thanks to the wonderful team in supporting our charitable goals and listening to our wacky plans for the festival! Bringing the BBQ to the festival! Thanks to Floreat Homes for sponsoring the brand new BBQ competition at Shrewsbury Food Festival this year! Providing the best holidays and also bringing the holiday spirit to our festivals - Thanks to Peakes Travel Elite for supporting us by bringing a massive sandpit to the festival so we can build sandcastles and dream of our next getaway! Aaron & Partners is a top 200 law firm offering bespoke legal solutions to people who own or run businesses, in their professional and personal lives. Their team brings commitment, technical ability and, most importantly, commercial acumen to a range of clients across Shropshire, Cheshire, North and Mid Wales as well as nationally in a range of specialist sectors, and can help your business make confident and informed choices by providing advice that is easy to understand. Looking after the festival goers of the future! Thanks to Tortoise Nursery for hosting the soft play tent - so our young festival goers can have a play around! Stan's are passionate about sharing their love of cycling with their customers. Put simply, they believe in bikes. We're so excited to be supporting their mission to get kids (and adults!) riding! Helping the Shropshire Festival Team clear up its act! Thanks to Gaskells waste for sponsoring us to enable a smooth clean up operation! Thanks to Tudor Griffiths builders merchants for helping us build our events for future years to come. The coolest web design and marketing agency! Thanks to the visual works for seeing our vision of colour and fun in our design desires! Creating support for job seekers and supporting the festival team so everyone can enjoy the weekend! Thanks to DM Recruitment for hosting the giant games area! Thanks to Hobsons for supporting us and providing the glasses for the on site Ale Trail! Thanks to these guys for the stunning orange aprons the chefs wear on the stages. For all the pots and pans that our amazing pots & pans the chefs use on stage. A huge thanks to Explorers at Sundorne for bringing the Explorers Cookery kitchen to kids at the festival! The fully trained team, caring and enthusiastic people, who understand the importance of your child’s individual needs. They welcome and value all families to Explorers at Sundorne! Come and meet the team and get the kids involved in cookery! Thanks to the wonderful, personable, helpful brilliant team at Oyster Communications who make our office an efficient printing powerhouse! Eden Power Ltd are one of the leading providers of solar PV and battery solutions in Shrewsbury. Our aim is to make renewable energy accessible to everyone from home owners to businesses so they can receive the benefits that a solar PV system provides.